Catching up from yesterday as I was a busy beaver getting for a road trip. Where are you going you ask? North! To get out of the Maryland summer heat. Get ready to cool down with me on coastal Maine. It’s time to enjoy Mount Desert Island and Acadia National Park for a couple of weeks. Still on the road but enjoying some gorgeous Vermont scenery. 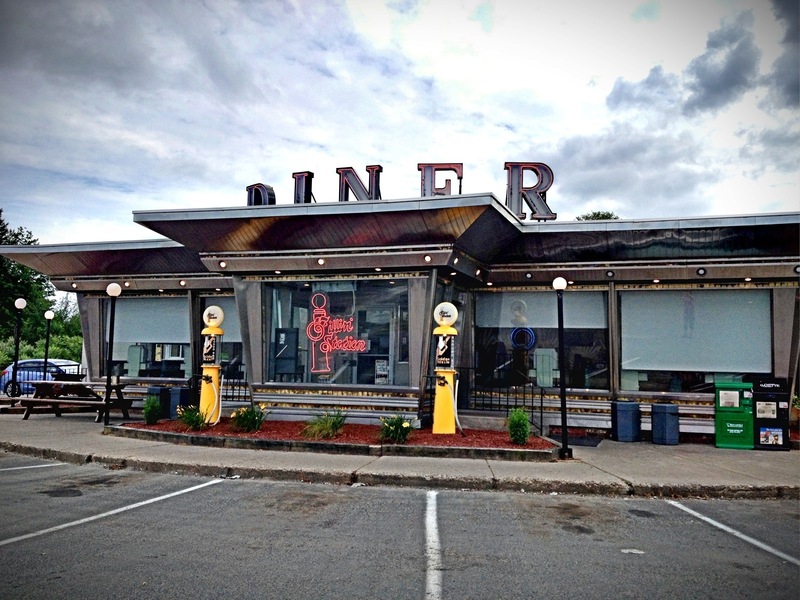 This diner was an authentic greasy spoon at a truck stop. It was original and sort of icky. No way would I eat there, but cool to look at. Oh Emily!!! Your photo is amazing – an iconic image of travelling across the country. If the smell hadn’t chased me out of there, I would have captured the characters inside. Truly an atmospheric place as you say. It really was ! Wish the owners had more pride to keep the inside clean and up to date though. It’s a classic. Great capture of the diner! Welcome to New England! How lucky you are to spend so much time in Maine, I’m so envious here! I’m sure that you will have some spectacular photos to share. You are truly too kind. We were here for a week last year and I realized it wasn’t nearly enough time for exploration. Thus the two weeks this year. Although I’m going to miss the ponies tremendously. I thought so too ! Really cool looking place..that is until you walk inside. Trust me..I can handle nearly everything, after living in Bolivia. But this place..no way would I eat or spend more than a couple of minutes there. It’s a shame though. I hope that you enjoy Maine as much as you normally do. This place looks like a step up from the typical truck stop greasy spoon, and if you describe it as just icky, it has to be a step up! Having a blast already. Went out to feed the mosquitoes on the trail that no one knows about. Heard several birds I don’t know. Can’t wait to get back out there in the morning. Maine is truly such a beautiful state. You’re right Lisa ! It truly is a special place. Too bad their winters are so harsh. I’m only missing 4 States on my magnetic map of the U.S. Campers will know what I’m talking about 😉 Maine is one of them. Oh I can’t wait to get there in fall. Thank you for giving me some anticipation! You’re coming here in the fall? That will be fabulous! Great texture in this frame. Nice capture of the diner. How was the chicken-fried steak and red-eye gravy? Oh no…this place was nasty. No way would I eat there. Trust me on this one. Great exterior visual though.